In this post we review a recent before-and-after study on hatchery steelhead published by Barry Berejikian and Donald Van Doornick (find the study here). The goal of this long-term study, conducted in a handful of rivers in Hood Canal, Washington, was to determine if a well-designed hatchery program could help rebuild populations of steelhead that had sharply declined. The data in this study focuses on the Hamma Hamma River, which is the stream where hatchery fish were released. The control streams — without hatchery supplementation — included the NF Skokomish, Little Quilcene, Tahuya, and Union Rivers. Before we get to the results, let’s look at how they conducted the broodstocking and evaluated its effects. First, the scientists collected eggs from several different steelhead redds and took those eggs to a hatchery. After hatching, some fish were reared for two years and then released as smolts, which is different from most hatchery programs (they usually release smolts as one-year old fish). For this study, the researchers released a total of 1,090-3,235 smolts per year. Some of the fish were reared an additional two to three years in the hatchery, until they were sexually mature adults. These fish were then released into the river. Essentially, they were releasing hatchery-grown O. mykiss that never went to sea but were ready to spawn and reproduce. 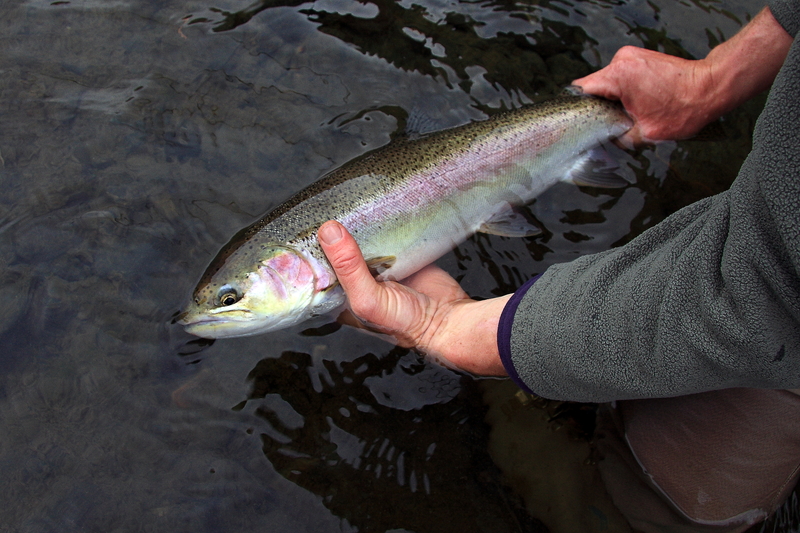 In total, they released 101 – 275 fully grown hatchery-reared adult steelhead, depending on the year. The scientists released the smolts and adults for a six-year period and then stopped all releases, at which point they compared the abundance of redds before, during and after the release of the fish. They also collected tissue samples from fish to look at genetic diversity before, during and after. In the Hamma Hamma River, which received plants of hatchery smolts and adults, mean redd abundance increased from 10 redds per year during the four years prior to supplementation to 26 redds in the five years after supplementation was halted. Redd abundance varied in the control streams that did not receive hatchery plants. For example, mean redd abundance declined from 123 redds to 37 redds and from 31 redds to 9 redds, in the Tahuya and Union Rivers, respectively. On the other hand, mean redd abundance remained fairly stable in the NF Skokomish. The Little Quilcene was the only non-supplemented stream where mean redd counts increased, rising slightly from 10 to 14 redds. In addition to increased redd abundance in the hatchery-supplemented river, the study also found greater genetic diversity in the supplemented population. This increase was presumably related to a greater number of spawners, because more fish tends to equate to more genetic material and hence more diversity. 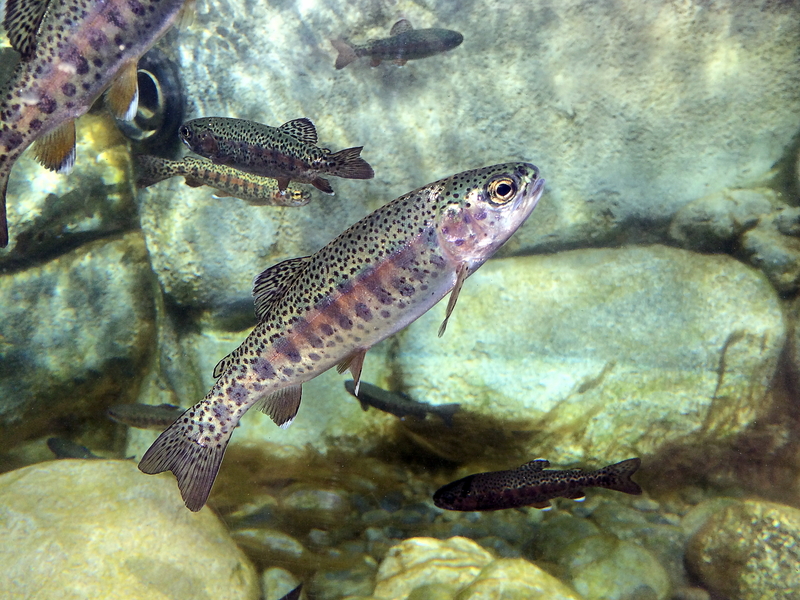 As the authors note, it’s possible that there were increased opportunities for resident male O. mykiss to mate with female steelhead, which also could have helped boost genetic variation. This is one of only a few studies to document an increase in steelhead redd abundance after hatchery supplementation has concluded. The authors employed several non-traditional techniques that may have contributed to this result. For example, they reared smolts to age-2 to mimic the natural age at which most smolts in the Hamma Hamma migrated to the ocean. They also collected eggs from a variety of nests, which ensured that those fish selected their own mates and that the authors used a diverse group of parents. Lastly, the study released a very small number of smolts compared to most hatchery supplementation programs. Rather than swamp the habitat with as many smolts as possible, the authors estimated how many smolts the rivers produced naturally and released accordingly. In contrast, most broodstock programs release tens of thousands of fish, often ranging from 50,000 – 100,000 smolts. Moreover, they released hatchery smolts and adults for only 7-years, then stopped to evaluate the program. Any combination of these factors may have been important in generating the data analyzed in this study. Whatever the reason, the program may have staved off extinction ultimately providing additional spawners and smolts that gave the Hamma Hamma population a demographic boost. It will be interesting to see whether the population boost provided by the hatchery continues into the second generation. This research is useful because it suggests that well-designed hatchery programs with rigorous science-driven techniques can help stop or reverse declines of steelhead runs in systems when the fish are nearing extinction. Further, and relevant to management, is they conducted a large-scale experiment to truly determine whether the program was successful using a before-and-after study design. We believe these types of large-scale studies are critical to evaluating the efficacy of hatchery programs and whether they are meeting their intended goals. Wild Steelheaders United and Trout Unlimited support a “portfolio approach” to steelhead management: those rivers which continue to support consistent runs of wild fish should be managed without hatchery supplementation while hatchery production can be employed in those rivers where wild runs are compromised and unlikely to recover. Any fisheries management strategy that relies on artificial augmentation of populations must be continually analyzed to identify programmatic or tactical weaknesses and to make adjustments to resolve problems and realize the highest return-on-investment. The Berejikian-Van Doornick study is a significant contribution to the body of science that helps us do that. 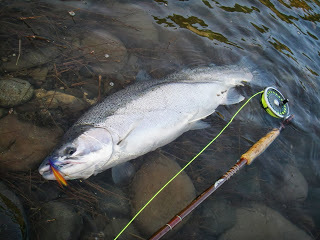 John McMillan is steelhead scientist for Wild Steelheaders United and Trourt Unlimited.